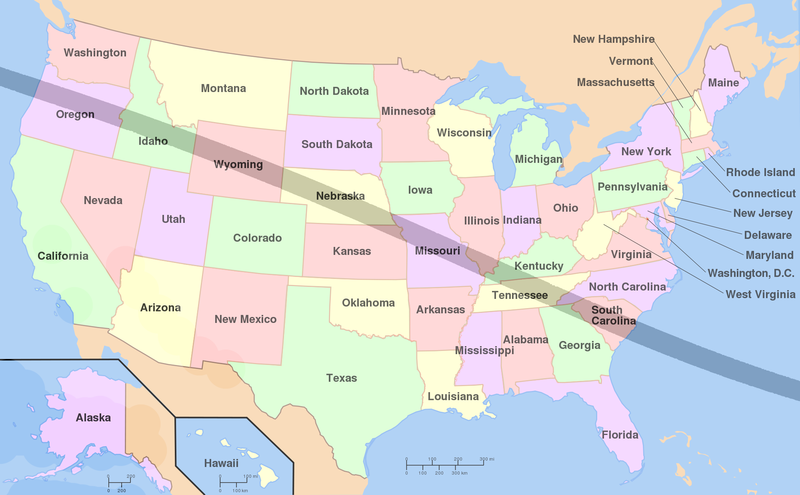 The “Great American Solar eclipse” is an eclipse of the US electional system, presidency and constitution: the darkness over Washington is a moment of reconnection – which potentials will it stimulate – and how? The Total Solar Eclipse on 21 August 2017 will take place at 28°52`56″ Leo exactly conjunct Washington`s astrogeographic position at 27° Leo (autocratic role of the president in US constitution), Donald Trump`s ascendant at 29°Leo (Trump`s personality), the Moon position of the Russian Revolution at 28°Leo (russian type of communism and centralism) the MC of the “Great American Solar eclipse of 8 June 1918” at 27°Leo (era of the dominance of the USA and polarity with Russia) and the position of Venus (territorial possessions, social recognition, income, fossil oil, harem culture, autocratic rule) from the “Great Pre Islamic solar eclipse” of 1 Aug 566 at 29°Leo. The degrees between 27° and 29° Leo are astrologically known as the climax of the evolution within the 30 degrees span of royal fire sign Leo and simply called the climax of royalty. The solar eclipse of the sphere of royalty during the “Great American Solar Eclipse” is symbolical of the eclipse of the american king aka its president. In other words: the climax of royalty is eclipsed right now and the Donald Trump presidency is the symptom of that situation. This takes us back to the question: what is the reason for the superstrong position of the american presidents and what is the strength of their position worth for the american people when the reality is such that the presidency is bought and sold? I`m suggesting to consider that this is the central question asked to the american people by the 21 August solar eclipse. The astrogeographicalposition of Washington on the royal degree of 27°Leo indicates that the roots of the ideal of a superstrong role of the presidents in the american political system was originally an adaptation of the european aristocratic systems – not necessarily only in Britain but particularly in the french absolutist and supercentralistic ideal. Leo represents the sign not only of the sun, centralism, royalism and absolutism but also of french culture. Another central site of resonance of this topic is the site of the Statue of Liberty located in Leo with Scorpio which was created in France. The astrogeographical coordinates of Washington 27° Leo and 6°Cancer bring together the strongest astrological resonators of the cultures of the two major colonial powers in North America at the time of the foundation of the USA. France (Leo) and Cancer (England). Please read my articles: Zwischen den Welten – zur kommenden Großen Amerikanischen Sonnenfinsternis am 21. August 2017, New Madrid Seismic Zone in astrogeography, The Equinoctial Solar Eclipse by a Supermoon on March 2015, Astrogeographic Position of Washington & Future Transits, The Astrogeographical Position of Washington in the history of the USA, The astrogeographical constellations of the US Presidents at the White House. During a solar eclipse the Moon as indicator for the suppressed and unexpressed, subconscious, unborn, the darkness itself, pending and waiting spirits, unfelt emotions, suppressed karmic issues and all kinds of inidviduals whose umbilical cords have not been cut – overshadow the Sun and Light. The astrogeographical longitude of the US capital Washington is located at 6° Cancer and it`s latitude at 27° Leo. This is valid for morphogenetic field level 1 which shows how the Central Government area is embedded in the whole of the USA. These coordinates provide a highly relevant astrogeographical definition for international comparison of the role, situation and transits of the government of the USA. For evaluation of the intense effects of a solar eclipse in relation to the astrogeoghraphic position of places consider the effects of the Equinoctial Solar Eclipse by a Supermoon on 20 March 20 15 on 29°Pisces which so strongly effected the European Union during the refugee flooding and neofascist propaganda Brexit in the years 2015 and 2016. 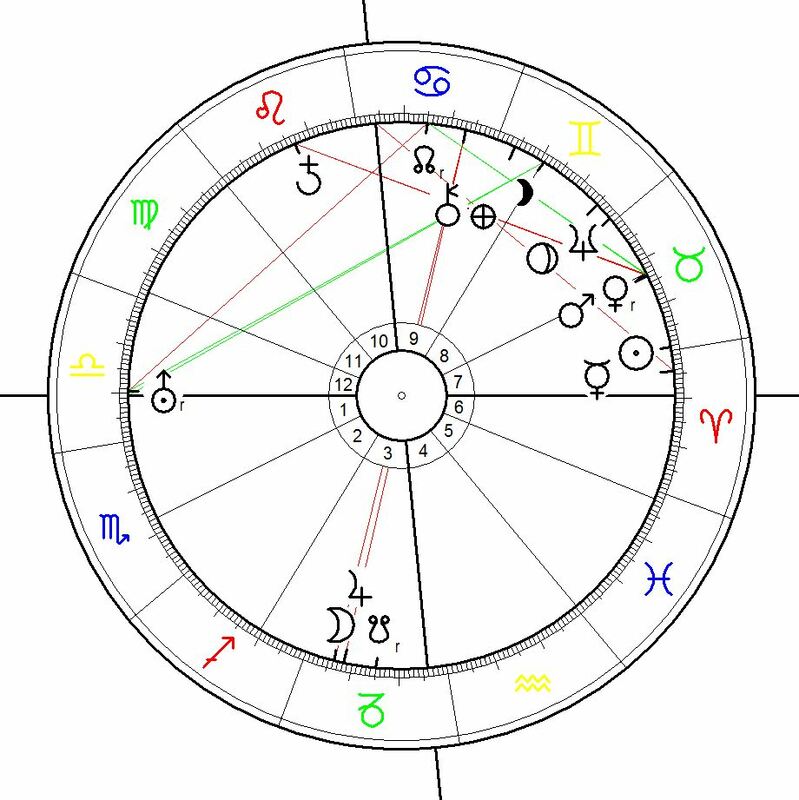 That solar eclipse took place exactly opposite Berlin (29°Virgo), square to Paris (28°Sagittarius) and Rome (29°Gemini) and conjunct Amsterdam (29°Pisces) – so activating the extreme tension on which the EU founding member states cooperation is based. Read my blog on that topic here: The Equinoctial Solar Eclipse by a Supermoon on March 20 2015. The darkness of that eclipse so intensely overshadowed the European Union that it was questioned really down to its fundaments by the following factors: the US Republican Party`s political strategy aimed at the destabilization of the EU, the Saudi/Republican Party alliance with ISIS and ISIS terrorist attacks in the larger european countries, the neofascist propaganda of the TrumPutin alliance and the Russian war propaganda, turkish politics of flooding Europe with refugees and the fast growing neofascist movements all across the European nations. Every single one of these factors should be taken into account when judging the potential effects of the coming Total Solar Eclipse over Washington`s astrogeographical position. The Total Solar Eclipse on 21 August 2017 will take place at 28°52`56″ Leo right next to the astrogeographical position of Washington of 27° Leo directly overshadowing the capital of the USA along with its government. 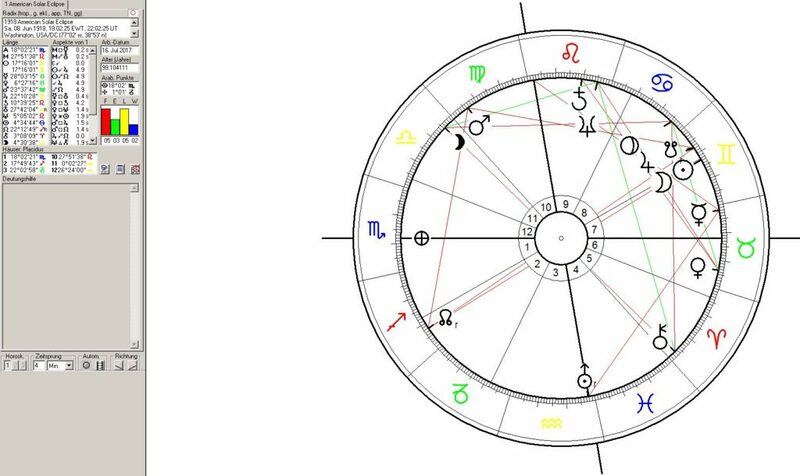 The position falls in exact trine (harmonious relationship) with Uranus on 29° Aries – indicator for the populistic and neofascist movement sweeping across our planet since the entry of Uranus into Aries in May 2010. The fact that Donald Trump`s ascending degree at 29°Leo falls exactly on the astrogeographic position of Washington means that Trump is to be understood as a direct representative of the topics of Washington and of the American Dream. Trump is the American Dream incarnate and his presidency its logical symptom. This conjunction of a political leader with the astrogeographical position of the capital is no exception at all – but in fact symptomatic for the current political scene: Emmanuel Macron`s sun position at 29°Sagittarius is conjunct the astrogeographical position of Paris at 28°Sagittarius and by the way in intense harmony (trine) with Washington! Angela Merkels`s Mercury-Jupiter conjunction between 9° and 12°Cancer falls on the astrogeographical position of Berlin at 10°Cancer and her Mars on 26°Sagittarius conjunct Paris. Compare my article: Stationen des Uranuszyklus – der Beginn einer neuen 84 Jahre Phase seit Mai 2010. Im suggesting that you should take into account that after a full 84 years circle around the sun on the day of Donald Trump`s inauguration on 20 January 2017 Uranus was exactly on the same degree as it was during Adolf Hitler`s inauguration into office on January 30 1933. Apart from that there is a long list of issues on the agenda that should be explored as potential topics to be dealt with by the stimulation of development through the energies set free by the eclipse. 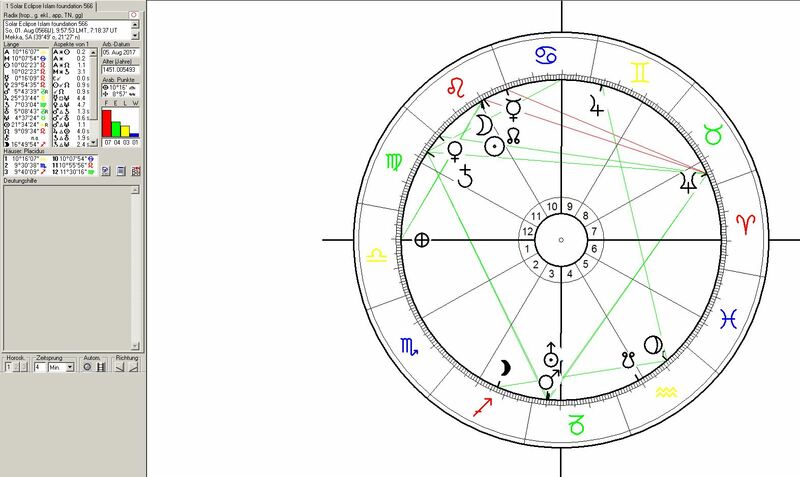 The impact of the trine of the eclipsed Sun at 29° Leo with the Saturn-Lilith conjunction at 21°Sagittarius the sign of direct profits and success by all means can be expected to be directly related to the changes brought about in the USA through the new neofascist government. Any eclipse brings up the topics stored between earth and moon: during a solar eclipse the Moon as indicator for the suppressed and unexpressed, subconscious, unborn, unfelt,spressed pain, the darkness itself, pending and waiting spirits, unfelt emotions, suppressed karmic issues and all kinds of inidviduals whose umbilical cords have not been cut – overshadow the Sun and Light . The Solar eclipse on 21 August will take place right on the astrogeographic position of Washington, the Moon of the Storming of the Winter Palace and on Donald Trump`s ascendant. So what will you predict: The Storming of the White House or other immaturities? 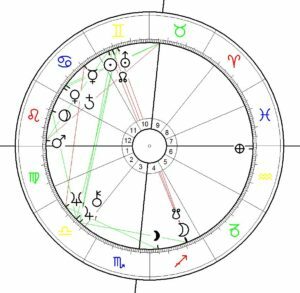 The Storming of the White House – The 21 August 2017 solar eclipse will take place on the Moon`s position in the chart for the Storming of the Winter Palace in 1918 and of course Trump`s ascendant degree. What was the date of the storming of the Winter Palace – oh just another 8 November – wasn`t it on a November 8 when Trump got elected ? The conjunction of the Eclipse position with the Moon position during the Storming of the Winter Palace could be a simple hint at the chance that the legitimacy of the US government could be questioned by the population. But because of the immaturity of emancipatory political movements in the USA stopping that president and the hypercapitalist lobbies behind the Republican Party through demonstrations or general strike seems to me implausible and impossible. The importance of the resonance of the eclipse´s moon position with the start of the russian revolution seems to be part of a larger and deeper process as can be seen from the chart of the last Great American Solar eclipse on 08 Jun 1918 at 18:06 (EWT (GMT – 4h) which accompanied the intiation of the USA into the role of the world`s global military, economical and political superpower through the fact that it was the USA that decided the European World War I during the months that followed the eclipse.. At the same time the 1918 eclipse over Washington gave birth to a new powerful enemy for the US economic and political system: the USSSR and the threat of socialist revolutions. Astrological chart for the 1918 “American Solar Eclipse” on 08 Jun 1918, 18:06 calculated for Washington. 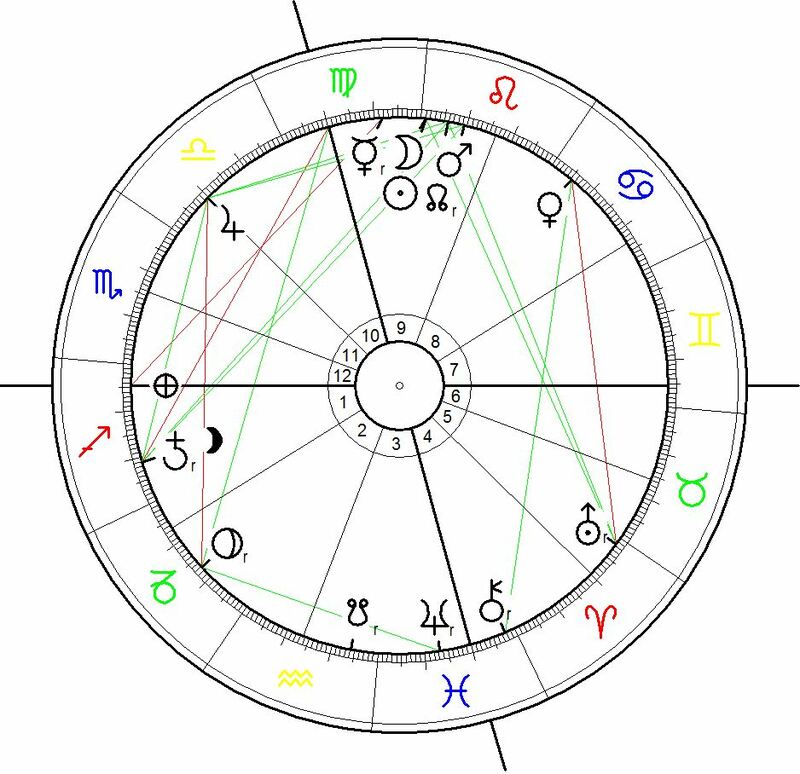 The eclipse took place at 17°16`Gemini the sign of technology, communication, globalization and most important astrological indicator for US american culture. When calculated for Washington the chart for the “Great American Solar eclipse of 1918” had Washington`s astrogeographic position (27°LEO), the Moon position of th storming of the Winter Palace (28°Leo), Trump`s AC (29°LEO) and the degree of the coming solar eclipse (29°LEO) on midheaven (MC) indicating that the current situation is to some extent the outcome, final aim and result of the process started in June 1918. This sort of indicates partnership between the American Union and the Soviet Union created by the russian revolution will reach its final aim during the coming two years while the effects of the 21 August 2017 eclipse unfold. It has to be seen that the USSR provided a partnership , competiton, enemy for the USA which was used not only to stimulate economical, technological and scientific progress but also to force the US political system into the role of the global hpercapitalist superpower in the disguise of the angelic spreader of democracy – seethe list of authoritarian regimes installed or supported by the USA. Looks like the change we are facing in 2017 is that the dominant role of the US as the only leading economic and political superpower which it had gained during the enmity-partnership with Russia comes to its end. At the same time two global players have grown equally strong in terms of economic power: China and the EU. What does the eclipse of the moon position of the “Storming of the Winter Palace” stand for in regard to Russian politics? As the solar eclipse of 8 June 1918 occured only 5 months before the russian revolution it initiated the world into the era of socialism. The capitalist answer to the socialist “threat” was fascism – directed against the spreading of socialist ideals through the USSR. That meant that the USA and other capitalist countries supported the spreading of fascism in Europe during the 1920ies and 30ies trying to stop the USSR from gaining influence. Now since around 2010 russian propaganda itself has decided to support and spread neofascism eclipting its old ideals and traditional positions. This can be clearly identified as an expression of the eclipse of the Moon position of the Russian Revolution. 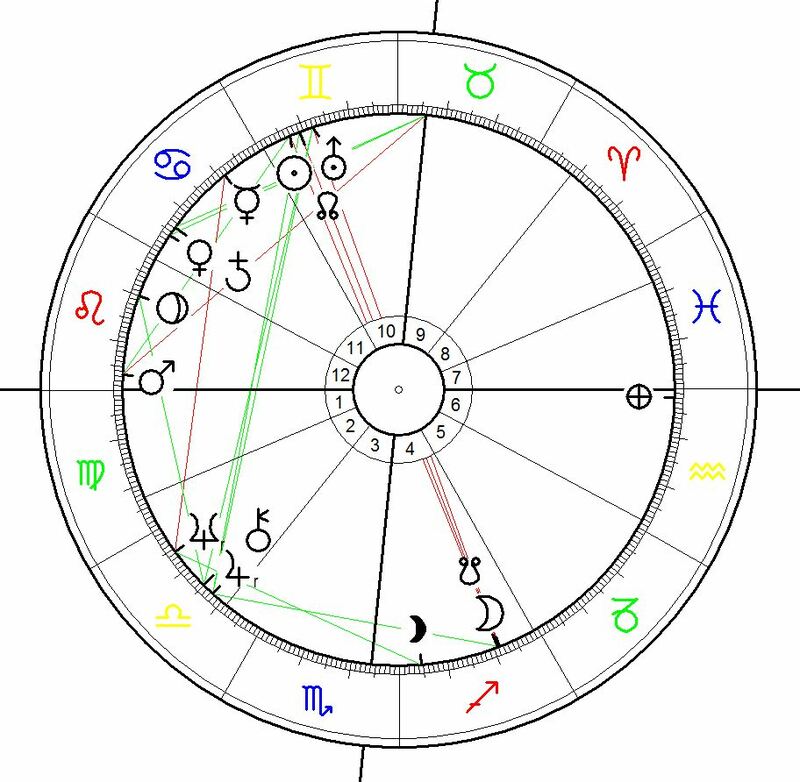 Birth Chart for Donald Trump born on 14 June 1946, at 10:54, Jamaica, New York. The Solar Eclipse on 29°Leo will take place exactly on the degree of Donald Trump`s ascendant. The fact that the solar eclipse degree will occur exactly on the ascending degree and Mars` position of Donald Trump is interpreted by many as the option of getting rid of that president through an assassination. I have to say that from a European point of view this is nothing more than an expression of the immaturity of the american constitution, political system, education and society as a whole. There seems to be no political option installed into the electional system and the democratic institutions like a simple plain vote of no confidence. This is absolutely tragic for a system in which the presidency is bought and sold. The inability of the political system in the USA to adapt the 18th century constitution to the country`s situation in the 21st century has led to the system of “the last days of the world like corruption” as installed by the George W: Bush administration which is now so dramatically being caricatured by the Trump presidency. Target: information. the waves of neofascist propaganda that are sweeping across the social networks and inernet media are organized by several global players mostly run by Russian secrete services and the US Republican Party Neofascist branch. The russian secret services most likely have been organizing the biggest and most effective war on this front during the last 4 or 5 years. The highly impropable case that a russian led propaganda machine would ever be able to bring their candidate into the White House has become reality. And what´s new is that this russian propaganda is working strongly from inside the USA. Birth chart for Adolf Hitler born on 20 April 1989: ascendant calculated for 17:56 as suggested by the Doebereiner rectification in the 1980ies with Hitler`s Uranus conjunct his AC at 20° Libra – birth place: Braunau, Austria. Target: peace with Russia is the biggest if not to say only really innovative potential of the lobbyists behind a Trump administration. 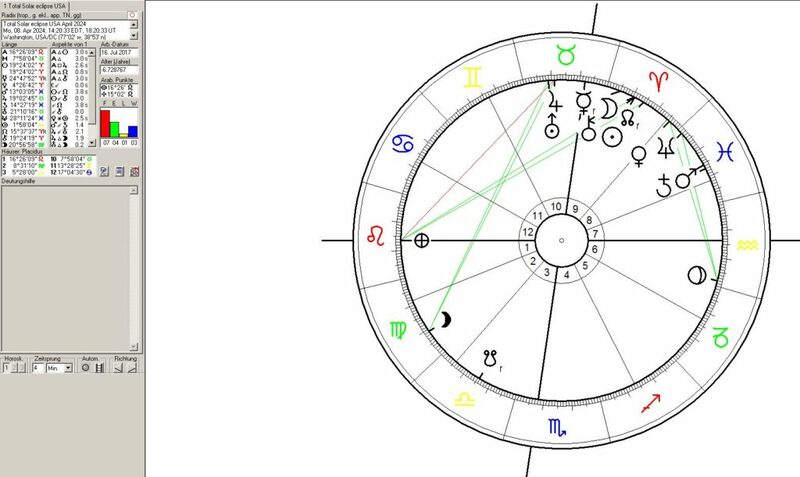 In the chart for the Solar eclipse it is represented by Guru (Jupiter) as the ruler of the Ascendant located on 20° Libra in house 11 falls on the Ascendant in Hitler´s natal chart and the position of Uranus. 20° Libra is the indicating degree for aristocracy, royal courts and solutions across borders and different spheres of interest. The 20° Libra position of Jupter as the ruler of the ascendant of the eclipse is the clearest indication for a worldwide conspiration and the collaboration of the two superpowers in order to establish their hegemonial rule over the planet. That is a step ahead for humanity in some ways, but with the immediate result of the suppression of the rights of the rest of the world and attacks on their territories and economies. 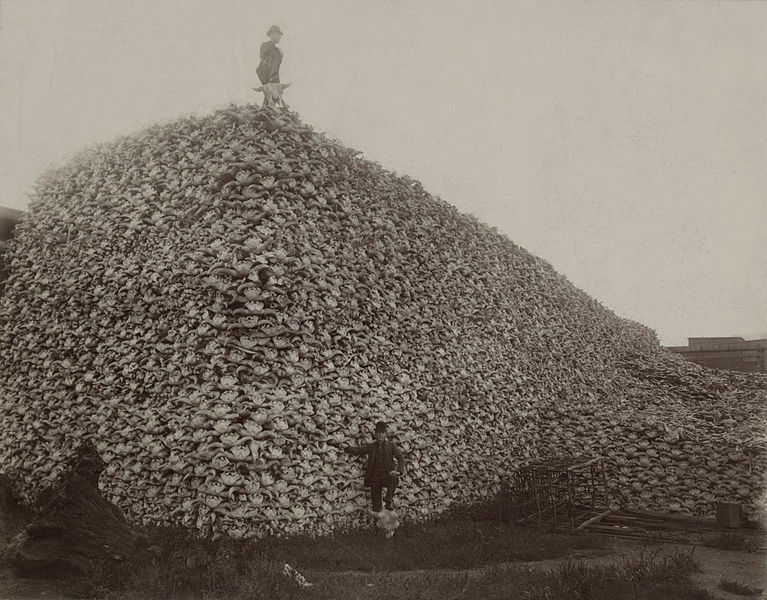 Back to the roots of the American Way of Life: Bison Skull Pile in the 1870ies reminds me of pictures from Auschwitz. The genocide against the buffaloes explains the roots of US american culture. The pain of the slaughtered buffaloes was engraved into the memory of the land to mark the american culture`s victory over nature. Back to the roots of the American Way of Life: Bison Skull Pile in the 1870ies reminds me of pictures from Auschwitz. The genocide against the buffaloes explains the roots of US american culture. The pain of the slaughtered buffaloes was engraved into the memory of the land to mark the american culture`s victory over nature. Using the land as a fracking paradise means implanting the information of destruction deep into the ground to make sure destruction is complete. Taget: the word Ecology deals with the capacity of aiming for survival of humanity on Mother Earth. The problematic issues here are ruthless exploitation and destruction of the natural ressources on our planet accompanied by the neglection of the central spiritual issue of living in harmony and friendship with nature through the profiteers. The Trumputin alliance must be expected to do anything (!) to continue the 70 years of politics of suppression of technological progress in the fields of production of electrical power along with it the spiritual dimension of living in harmony with the fuller potentials of our physical and spiritual bodies. Ecology is one of the most important aspects to be considered for a whole number of reasons. Overpopulation and globalization as direct results of technological progress are the cause of the ecological problems created by humanity. In politics Ecology means dealing with the “wrong shui” ( blocks of energy flow) installed into the morphogenetic surface field by the profiteers from the destruction of nature, pollution of the oceans, burning down of the rain forrests, contamination of water through fracking, nuclear waste, the chemical industries. On a psychological level Ecology means taking over responsibility for our sadness, pains, mental projections, hate, destructivity which we unload onto the memory of the places where we live. Target USA: The Unity of the USA is definitely in question and the secession of some states from the Union is a logical consequence to be called for even though I still doubt that this will actually happen. The “Fort Sumter” transit of Neptune into the square position to the 6° Cancer coordinate of Washington in April 2025 will be the final test for the stability of the Union. The Calexit Talks are a clear sign of the relevance of this topic. Read more about the first Neptune return to the Fort Sumter position here: The Astrogeographical Position of Washington in the History of the USA. Target civil rights and democratic institutions: It is to be expected that the Trump administration will attempt to abolish more and more democratic rights the longer it stays in power. All States may have to deal with the question: staying in the USA or protecting democratic rights. Target NATO: The splitting and as far as the russian side is concerned the abolition of NATO is a logical consequence and a central aim of the Trumputin collaboration. That may be felt as positive and in many ways it certainly is. But the Russian – American – British collaboration is an even more powerful alliance than NATO has ever been. That part of the military alliance between Russia and USA is clearly headed at the installation of a Russia – USA controlled world government. Target EU – the largest economy in the world: The social networks propaganda machine built up by the US – Russian – British secret services when operating together can be expected to manage to split up the largest economy in the world the EU through a mixture of tactical maneuvers and direct military pressure on the East European States especially Ukraine, Baltic States, Poland, Belarus, Bulgaria, Hungary, Romania but as well on Germany and France. The first targets in Europe directly threatened through the Solar Eclipse position at 28° Leo are: Sofia (Bulgaria) located at 27° Taurus – 19° Scorpio, Talinn (Estnia) at 27° Scorpio – 13° Aries and Minsk (Belarus) at 26° Leo and 0° Capricorn. 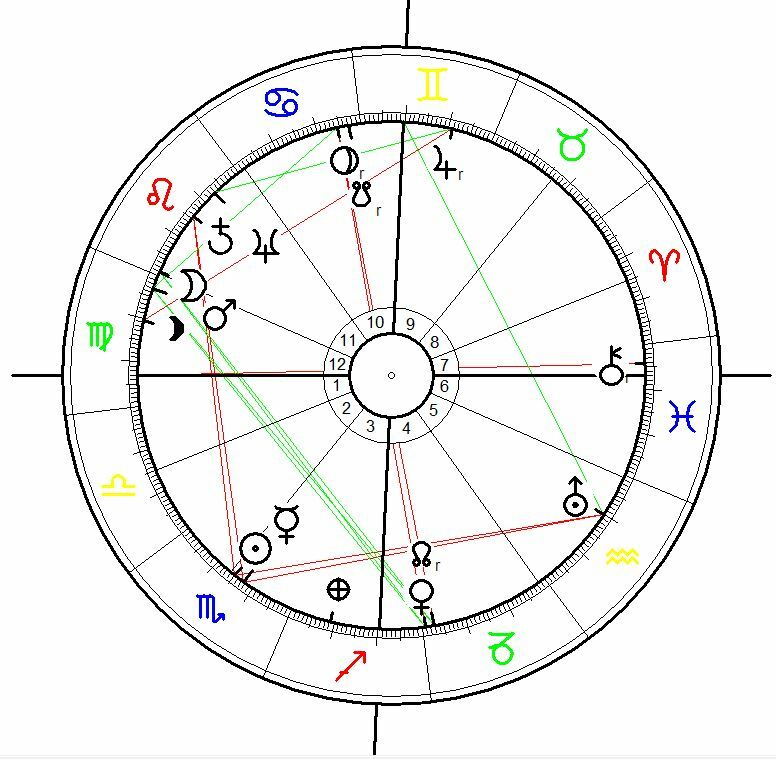 The eclipse position of Mars at 20°41` Leo falls in exact square to EU capital Brussels` astrogeographic position at 22° Scorpio – indicating a direct attack on the European economy, currency, independece and all EU institutions with the clear aim to take over control over Europe. The August 2017 eclipse position of Chiron on 28° Pisces as the ruler of midheaven will be conjunct the position of the Central European solar eclipse of 20 March 2015 at 29° Pisces. Compare: Astrogeographical position of Berlin and Future Transits. The impact of the 2015 and 2016 refugee crisis on the EU acoompanied by heaviest and highly effective fire from the russian/british/american war propaganda machines in the social networks is to be considered as a clear “result” of the 20 March 2015 solar eclipse. Pseudo Target Islamism: Islamism is a US created politcal instrument and not a plausible realistic target of the Russia – USA alliance. It can be expected that islamism will be further bred by that coalition in order to keep it alive for propagandistic purposes and to justify and hide their own negativity. This was the real function for which it has been created. Another plausible purpose islamism will be used for in the future is the control over Africa through destabilization. A side effect of the employment of islamism for that purpose is the pressure on the European Union through migration. The total solar eclipse of 566 occurred with Venus on 29° Leo exactly on Donald Trump`s ascendant and the position of Washington. The Venus position from that eclipse which will be eclipsed by the coming “Great American Eclipse of 21 Aug 2017” can be seen as archetypal for all aspects of Venus in the history of Islam: its extremely fast spreading, territorial possession, the wealth of islamic countruies, the profitability of Islam for the ruling kings and presidents, islamic harem culture and the promise of the abundance (29°Leo) of “huri” in paradise (house 11), wealth from fossil oil (fossil oil as stored sunlight = Leo), autocratic feudalism and centralism in islamic society and the self-image of men as kings in islamic culture. IIt has to be considered that the chart for the Great Pre-Islamic solar eclipse resonates with the historical events of the superfast spreading of Islam through military invasion of the largest parts of the known world at the time during only 200 years of its existence. This global effect of the spreading of Islam is eclipsed – which means reconnected with the karmic evolutionary intention which made it so successful. Along with the centralistic, autocratic rule of the Saudi-Arab caste system and profitability of the autocratic Saudi pseudo-religious rule over theIslamic culture, religion and spirituality in the conquered territories (muslim countries). The next really tight planetary challenge for the US government will be Saturn`s transit over 6° Capricorn in opposition to Washington. The start of this process will be triggered through Saturn`s ingress into Capricorn the sign of reforms and stability on 20 December 2017 and end in December 2018. The transit stands for the legal challenge of the government and the conscious recapitulation of problems unsolved in the past. It is an ideal moment for all reforms and updates made to protect the stability of the Constitution and the Country as a whole..
After that Saturn`s next transit in tension to Washington will also be in opposition to the government. It will be effective between May 2022 and March 2023 when Saturn passes 27° Aquarius in opposition to Washington`s astrogeographical latitude at 27° Leo. One year before the Neptune transit Uranus will be moving through the last degrees of Taurus in the Pearl Harbour constellation over the square position to Washington at 27° Leo. This stimulation of working on unresolved issues through Uranus will last from May 2024 until April 2026. A positive way of dealing with this heavily threatening transit would be a discussion of astrologers which should best be started now – in July 2015 as Jupiter is transiting over the 27° Leo position of Washington. The “Fort Sumter Constellation” or “Secession Constellation” which repeats itself when Neptune enters into Aries triggering the square position to Washington`s 6°Cancer coordinate is due in April 2025 and will be effective until about April 2029. This will be the 2nd ever transit of Neptune over that position in the history of the USA and the first time since April 1861. Even if there was no new secession to be expected the emancipation of single states in the USA from the grip of the out of date majority voting system, the two-party sytem and the degenerate US type of presidential elections may be stimulated during that period. Total solar eclipse on 28 April 2024 at 14:20 EDT calculated for Washington D.C. The next Total Solar Eclipse over the USA will be in only 7 years. The eclipse position at 28° Aries will be in exact trine to the 26° Leo position of the 2017 “Great American Eclipse” and the astrogeographical coordinate of Washington at 27°Leo. That harmonious aspect is a clearest sign that the development initiated in 2017 will be brought further by the effects of the 28 April 2024 constellations. The Jupiter-Uranus conjunction in house 10 in Taurus stands for option (not more than the option of course) of the healing of the current problematic issues and degenerate tendencies of the political system in the USA. Plus that it clearly indicates all options for highly innovative economical developments. Mecury at midheaven though it may look highly positive in terms of financial profits has to be handled with care as it shows no trait for an emancipation of the american people from their hypercapitalist domesticators. I agree that the Mars-Saturn conjunction (constellation of the warrior caste) in Pisces could suggest things like submarine warfare but want to remind everyone that the UN has it too in its foundation chart. I believe it rather stands for the need to fight the pollution of the oceans with plastic, the ground water through fracking, food through chemicals and the human perception through manipulation.